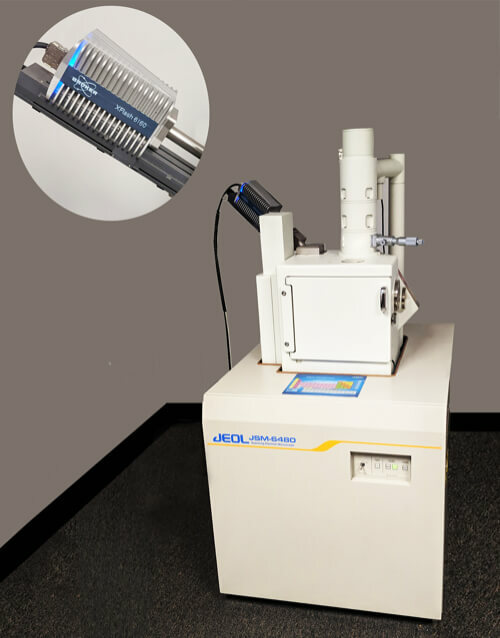 Energy Dispersive X-ray Spectroscopy - Micron, Inc.
Energy Dispersive X-Ray Spectroscopy (EDS) extends the usefulness of SEM in that elemental analysis can be performed within regions as small as a few cubic micrometers. All elements from boron through the periodic table can be detected with sensitivities of approximately a few tenths of one percent. EDS Spectra – Graphical plot of peaks identifying elements detected within the area analyzed. The area analyzed can be adjusted to encompass sub micrometer or several millimeters. The intensity of peaks (peak height) is related to the elemental concentration. BSE Imaging – Variations in the average atomic weight of the material is depicted as variations in the gray level of the image. Elemental Mapping – Photographic images depicting the distribution of the elements of interest. Variations in gray level of the image are related to variations in the elemental concentration. Images can be obtained for all elements of interest. Concentration Profiles – Graphical plot of the elemental concentration as a function of distance along a given line on the sample. Standardless Semi-Quantitative Analysis – Quick semi-quantitative estimate of elemental concentration.